Thorgersen, M. P. and Adams, M. W. (2016). Nitrite Reduction Assay for Whole Pseudomonas Cells. Bio-protocol 6(10): e1818. DOI: 10.21769/BioProtoc.1818. The second step of the dissimilatory denitrification pathway in which nitrite (NO2-) is converted to nitric oxide (NO) is catalyzed by the enzyme nitrite reductase. Two distinct enzymes are found in nature that catalyze this reaction, and they contain different metal sites, either iron (Fe), in the form of heme, or copper (Cu) (Zumft, 1997). The Pseudomonas stutzeri (P. stutzeri) RCH2 strain used in this assay contains both an Fe and a Cu form of nitrite reductase. 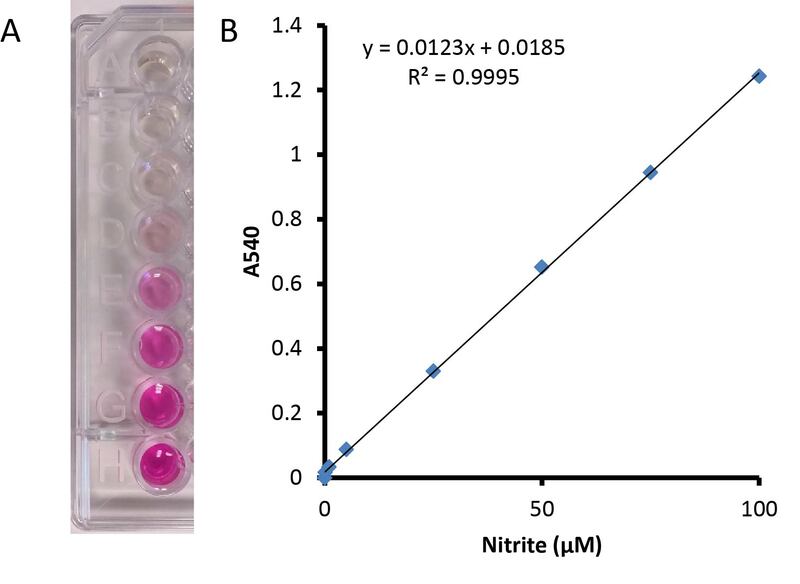 In this assay, total nitrite reductase activity can be measured in whole cells using fumarate or some other carbon source as an electron source by measuring the disappearance of nitrite over time (Thorgersen et al., 2015). Cultures (5 ml) of P. stutzeri RCH2 were grown anaerobically with shaking (250 rpm) at 30 °C in Hungate tubes on M9 salts supplemented with 20 mM fumarate as a carbon source, 20 mM nitrate as an electron acceptor, and 0.5 g/L yeast extract. Cells were harvested during late log phase (OD650 0.7-0.9) by centrifugation at 4 °C (10 min at 5,000 x g) and washed once with pre-chilled (4 °C) 50 mM potassium phosphate buffer (pH 7.0) before being resuspended in the same buffer at approximately 3-7 x 109 cells/ml. In a culture tube, 500 μl of cell suspension was added to 4.5 ml of assay buffer. The assay was incubated at 30 °C with slow shaking (150 rpm) in an incubator. The volume of cells added can be changed to optimize reaction speed. Samples (100 μl) were taken every 5 min or longer as needed for 20 min to1 h, and were diluted into 900 μl distilled water. One ml of Griess reagent was added to the samples and they were incubated for 15 min at room temperature. The visible absorption at 540 nm was measured for each sample, and nitrite concentrations were calculated using a nitrite standard curve made in 50 mM potassium phosphate buffer (pH 7.0) (0-100 μM nitrite) (Figure 1). A unit of nitrite reductase activity catalyzed the reduction of 1 nmol of nitrite/min. A negative control using 50 mM potassium phosphate buffer (pH 7.0) without cells was also performed. Figure 1. Standard nitrite curve from 0-100 µM nitrite mixed 1:1 with Griess reagent. A. The red-pink color develops when the Griess reagent is added to the nitrite containing sample. B. A linear standard curve is shown with values ranging from 0-100 µM nitrite. If there is a concern about oxygen lability of the nitrite reductase enzyme, the method can optionally be performed anoxically with the use of sealed Hungate tubes where the headspace is exchanged with high purity 100% argon. The nitrite reductase activity of P. stutzeri RCH2 was stable in the presence of oxygen over the time period of the assay. Other carbon sources other than fumarate can be used to fit the carbon source preferences of the microorganism being studied including but not limited to lactate, pyruvate, and glucose. Nitrite reductase may not be as highly expressed if the microorganism can ferment the carbon source used rather than depending on nitrate or nitrite as electron acceptors. Additionally, cells were grown anaerobically in the presence of nitrate as an electron acceptor to increase nitrite reductase expression. Nitrite (2-10 mM) could also be used as an electron acceptor depending on the tolerance of the organism being assayed. 1 M solutions of KH2PO4 (A) and K2HPO4 (B) were made separately. A mixture containing 39% (v/v) solution A and 61% (v/v) solution B was made. The pH of the mixture was adjusted to pH 7.0 with solution A or B before diluting. Dilute the stock solution 1:20 with distilled water (final concentration: 50 mM). This material by ENIGMA (Ecosystems and Networks Integrated with Genes and Molecular Assemblies) (http://enigma.lbl.gov), a Scientific Focus Area Program at Lawrence Berkeley National Laboratory, is based upon work supported by the U. S. Department of Energy, Office of Science, Office of Biological and Environmental Research, under contract number DE-AC02-05CH11231. Zumft, W. G. (1997). Cell biology and molecular basis of denitrification. Microbiol Mol Biol Rev 61(4): 533-616. How to cite: Thorgersen, M. P. and Adams, M. W. (2016). Nitrite Reduction Assay for Whole Pseudomonas Cells. Bio-protocol 6(10): e1818. DOI: 10.21769/BioProtoc.1818.